Kids soccer cleats and soccer balls aren’t the only thing you’ll need for your youth player this season. Luckily the required equipment checklist for youth soccer is pretty short. If you buy soccer cleats, a soccer ball, and some shin guards your kid should be “pitch legal”. However, as usual for a soccer parent it’s never that easy. I still remember my first game as a soccer dad in the early spring when my son had no hat, no gloves, no coat, and no water. I thought I was doing pretty good to get him there on time with his cleats and his ball but soon learned there’s more gear you’ll want as a soccer parent than they tell you about at signups. 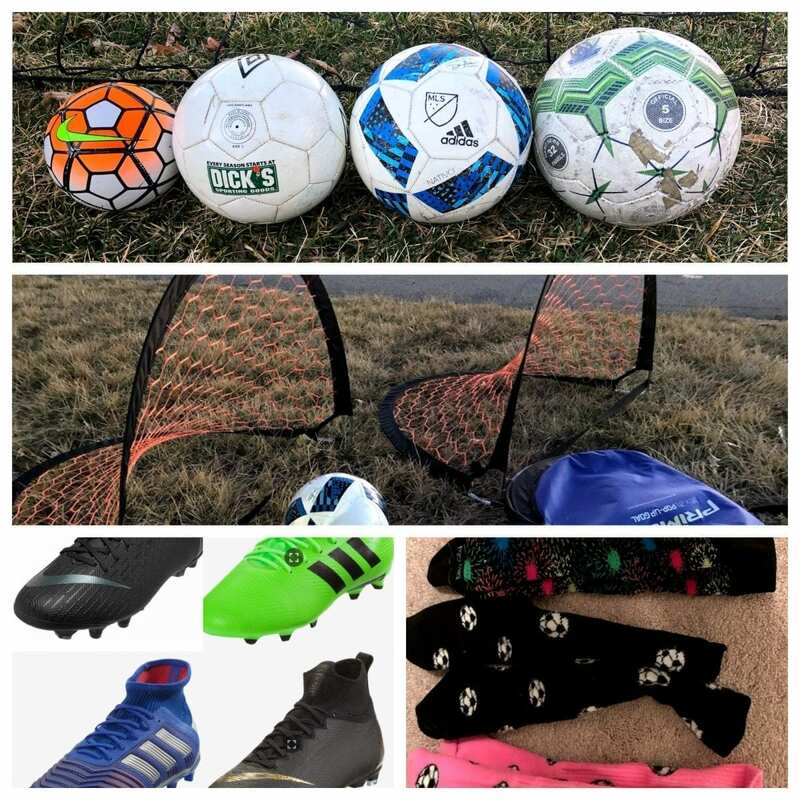 Now several kids later our mini-van is a travelling soccer gearbox so we thought we’d share some of the things that will make practices and games better and more enjoyable for youth soccer players, parents, and siblings. Youth sports can get expensive so we tried to share ways to save money and suggest items that we’ve used that get the job done but are affordable. Some of the things we share here use our referred by Soccer Stripes link so if you end up needing them we’re sent a small percentage of the sale. We only recommend items that our family has used ourselves or that we would buy for our kids. The good news is that when players are young their gear is pretty affordable. You can find kids soccer cleats online for under $20 until they reach around a size 6. As they get older the cost of cleats can go up quickly but if you know how you can still find cheap soccer cleats online. The more kids you have playing the more you’ll spend so the better it is to be able to find the best soccer cleats sales. One benefit of multiple kids is that you can pass them down after a season or two. If you have both girls and boys playing try to buy more neutral cleats so more than one kid can use them. There’s also a pair of Puma ONE cleats on the same site for even less, $20 or $18 if you’re part of their Goal Club. Since the price can vary so much what some soccer parents do is give their kids a “budget” in terms of what they’re willing to spend and anything above that the player has to come up with on their own. Typically when they’re younger kids don’t care as much about what kind of cleats they wear but the older they get the more interested they are in buying the higher end cleats. The same goes for most kids soccer shoes, whether they’re cleats or indoor soccer shoes or turf shoes. You’ll find a big range from the low budget options all the way up to the high end shoes that cost two or three times more. What we usually do is keep our eye out for sales and buy discounted cleats at the start or end of the season. When you’re shopping for soccer balls you’ll find a huge range in price. You can get cheap soccer balls for under $10 if they’re on sale or you can spend a ton of money on a really nice ball. Just yesterday I was talking with a soccer dad who said he looked up the best soccer balls for kids online and bought one for each of his kids. He spent about $17 a ball on size 3 soccer balls. Since he had already made the purchase I hated to mention that he could have spent half of that and used his savings to buy extra balls for when others are lost. If you’re buying soccer balls online you have to factor shipping costs into the sale price. Some sporting goods stores will give you free or discounted shipping with a minimum order amount so you could buy several and save some for future seasons. Or another approach is to buy enough to get free shipping and split the cost of the 5 soccer balls with a few other families on the team. One of the questions we get a lot is what size soccer ball for U8 or some other age group? Although US Soccer has recommended soccer ball sizes it seems like parents are often eager to move their kids up a soccer ball size before the suggested age. I think it’s mostly the same reason that parents buy uniforms a size bigger then needed, so kids can grow into the ball. We have size 3, size 4, and size 5 soccer balls floating around our house and our 6 year old is fine with using either the size 3 or size 4. It’s certainly easier for her to manipulate a size 3 but she can handle the bigger ball. We prefer for her to use the size 3 ball because we want her to focus on mastering ball skills and using the smaller size ball removes an obstacle of shorter legs dealing with a bigger ball. I know there are differing opinions on the topic but if you’re buying a new ball and your kid is one season away from moving up a ball size I’d say to stay with the recommended size. As long as you’re not spending a lot of money on a soccer ball then just get them a new ball when they age up. Especially if you have more than one kid who will play since then you can pass down the soccer balls you buy as the oldest kid gets new soccer balls. If you’re shopping for soccer ball deals one thing to keep in mind is that many places also sell as Size 1 soccer ball, also known as a “skills ball” or maybe a mini soccer ball. So if you see a really cheap soccer ball that seems too good of a deal it could be that you’re looking at a Skills ball. They’re actually nice to have around the house, we have a few we keep inside that the kids kick around or juggle in the kitchen or family room. Just pay attention to the size so you don’t think you’re ordering a size 4 for a good deal but then get a surprise when it arrives and it’s a Size 1. If you’re trying to order a regular soccer ball, just check it doesn’t have the words “Skills Ball” in the item description. Since so many soccer balls look the same it’s a good idea to write the players name and phone number on the ball. If you’ve ever peeked inside the lost and found bin of a soccer league you’ll know the benefit of getting your name and number on the ball. Whether you’re digging through the lost and found or searching for a ball at the end of training you’ll be glad to have it labeled. Just last night we trained with a team on either side of us and several of the boys across the 3 teams had the same soccer ball. Not all of them had their name on the ball but enough did to sort out the right owners after practice. The week before one kid went home without his ball because another team had left with it mistakenly. Luckily his phone number was on the ball so he got a call from the coach a few nights later and had his ball back this week at practice. Even if you use a Sharpie the name and phone number wear off eventually so at the start of each season try to re-apply before the first practice. Our experience has been you can find some good deals at the start of the season in local sports stores but at other times of the year shopping for soccer balls online will get you the best price. If you can find a good deal on a ball it’s worth buying an extra soccer ball or two. That way if you lose one you won’t have to go buy another at full price. Also, if you’re working on shooting it’s nice to have a few extra balls so they can get into a rhythm as they work on their shot. We ended up buying a bunch of Adidas MLS Glider balls at year end close out at soccer.com along with a gear bag to hold them and threw them in our car for soccer practice and kick arounds. When kids are young they like the stirrup shin guards because those have extra padding in the ankles to protect them from all those hacking little feet on the field. They also have a strap that goes around the back of the calf that helps the shin guards stay up. At the start of the season some sports stores have soccer packages where they offer cleats, shin guards, and a ball all together – typically this is the kind of shin guard that comes in those packages. Slip in shin guards can be a pain for younger ages because you often need an extra compression sleeve to keep the shin guard from sliding around in the sock – who can remember to bring shin guards AND compression sleeves right? There is a new kind of slip in shin guard that has a texture that helps it stick to the sock and move around less which really helps. As players get older they often start to prefer the slip in’s because they’re easier to put in last minute and take out after practice or a game. There’s not much money that can be saved on shin guards since they’re not that expensive in the first place and a kid can usually get a few seasons out of a pair. In fact, it might be worth getting an extra pair of slip in shin guards. Referees won’t let kids play without shin guards so if they’re checking in and forgot to on the slip ins are easier. Especially if you’re running late and forget to have them put on shin guards it’s a pain to take off their cleats and socks to get their shin guards on. For those times it might be nice to keep a pair of slip in shin guards in their soccer bag. When kids are young you don’t really need a goal at all. You can just setup two cones and have them score between those. As they get older you can get small pop up goals that don’t take up much space to store and are easy to transport. There are different sizes of pop up goals, for example Primed has a 3×2 and a 6×4. In our experience we go with the smaller size since the larger popup goals tend to flip over and move around a lot more. You can also get a more expensive pop up goal made by Pugg that is weighted so it won’t blow over in the wind or flip over as easily when hit with a ball or by a player. Many of the other pop up goals come with stakes for anchoring it into the ground but if you’re playing indoor in the winter or training on turf those obviously won’t help. It is nice to have the weighted goal that doesn’t slide around so if you’re going to have it for a number of years the Pugg goals are worth the extra cost. As they get older your player will want to start working on shooting. If you’re lucky enough to have a park or field nearby with a soccer goal then you’re all set but if not then it’s a good idea to look into a big soccer rebounder. The benefit of a rebounder over a goal is that the player doesn’t spend half their time chasing the ball into the goal to retrieve it. The number of shots they can take in a play or practice session with a rebounder is a lot higher since the ball comes back to them. Of course if they put it over or wide of the goal they’ll still be chasing, but that’s when it’s nice to have a bag of soccer balls as we talked about earlier. Whether you go with a goal or rebounder something to think about is the storage and moving of it, unless you can just keep it up all the time. They do have inflatable and collapsible goals that fold up and away for storage. Of course the challenge with this approach is that it’s not easy for a kid to just run out into the yard and kick around for a few minutes. We always like to encourage frequent “free play” where kids just go out to shoot and juggle for fun and that’s easier to do if the goal is already setup and waiting. If they need you to setup the goal for them it becomes more of an obstacle for that free play approach. Of course if your space is limited then folding goals or inflatable goals might be your only option. One rather new soccer goal that we’ve had our eye on is part goal and part rebounder, called Open Goaaal. We haven’t had a chance to try it out ourselves but the design is pretty slick. There’s a goal in the middle with netting around the top and sides that serves as both a backstop to stop missed shots and also as a rebounder. It can raise up for mowing which is nice, our rebounder has too many holes near the bottom from weed eaters which makes for annoying spots where shots just go right through. You can also push the Open Goaaal net over to the side when you’re not using it. It’s pretty comparable in terms of price and they do offer seasonal sales, you can use an Open Goaaal coupon code for a discount and free shipping. The rebounders we mentioned above goals are bigger goal size rebounders, with a big frame. There are also smaller rebounders like the Soccer Wave and SKLZ Quikster. We don’t own either of those ourselves since our basement isn’t finished yet so we have lots of concrete walls to use for wall work. Our kids have used the SKLZ Quickster at soccer training and I tried out the SoccerWave at the last United Soccer Coaches convention. These smaller rebounders are easy to store, great for the winter months. They’re good for getting in lots of touches and working on first touch in the garage or basement. One neat thing about these rebounders is they’re designed to play the ball back to your kid in different ways depending on how the pass is played in. Certain parts of the rebounder play the ball back similar to how a wall would return it straight back. Other sections of the rebounder will pop the ball up into the air so kids can work on receiving different types of passes. If they’re using it like a wall they could probably use it in your living space but if they’re playing back aerial balls then they probably need a little more space like a garage, basement, or backyard. Both the SKLZ Quikster and the Soccer Wave run a little over a hundred dollars but are both cheap compared to the high end soccer rebounders like the Munin m-station which starts around $600. Another option is to build your own rebounder. For a long time there were plans online for the SoccerHop, basically instructions on how to build your own soccer wall. They were pretty good and cheap plans but last time we checked they weren’t available any longer. A few copies of it are floating around but the ones we saw tried to install something on your PC when you try to access it so we’d steer clear of those. However, now you can find several free soccer rebounder plans a few places online. One soccer family that goes by 24x7soccerus on twitter shared pics of their soccer wall and videos of it in use along with the materials list and some plans for building the rebounder. They estimate around $55 to build the kick wall shown in the photo. If you don’t have a circular saw or a mitre saw to cut the wood yourself they suggest just having the lumber store where you buy the supplies make the necessary cuts before you bring it home. Checkout their post on Twitter to see the kick wall plans and photos. If you’d like a little more step by step help then Coach Javi made a video on what materials to buy and how to assemble your soccer wall and shared it on Youtube. His model costs a little more to build, around $85 in supplies but is pretty heavy duty since it uses bolts rather than screws. Here’s the video showing the project from start to finish, he ends showing ways that a player can use the rebounder to train on their own. There’s one more video that shows how to build another model that uses fewer parts so it’s cheaper. The family that builds it estimates the parts to run around $30 and the build time to be about an hour. One neat feature of their design is you can use it as a soccer wall where the ball comes right back to you OR you can flip it over and use it as an angled rebounder where the ball returns to the player in the air. If you’re interested in making your own you probably want to check them all out because each has their own suggestions like waterproofing to help it last and adding a handle for carrying. If you live close to a tennis court then you’re in luck. Playing soccer tennis is really good for developing touch and juggling skills and is a lot of fun. You can play 1 on 1 with your kid or if you have enough people you can play doubles. Playing doubles is good for working on communication, which most young players can always use help with. Playing against just one person on a full size tennis court forces you to cover a lot of ground and is a great workout. It’s good for kids to learn playing the ball out of the air and the timing of hitting a ball one direction while you’re moving the opposite direction as you dash around the court. One of the best purchases we’ve made as soccer parent has been a soccer backpack. When you’re chasing multiple kids around in the evenings and weekends it’s nice for them to have a bag to help keep all their necessary gear organized and make sure they have it when they need it. As you’re loading up the car they can grab their soccer backpack that has their water bottle, soccer ball, shin guards, shoes, practice shirt, jersey, etc. Of course they have to remember to put all the soccer gear in their bag but odds are a lot higher that the necessary equipment will come along if most of it is in the bag to begin with. This also makes it a lot easier to store their gear when they’re not using it. Just hang the bag on a hook in the closet or garage so they can easily put it away as they head in from training and grab it as they leave for games. To help make sure no other kid picks up their bag by mistake it’s really helpful to have their name on the bag. When you order the bag some places will let you add the player name for an extra fee. In our experience having the player name on the bag can save you a lot of hassle so it’s worth the cost. Not only does it help prevent bags going missing it can be helpful when all their bags are lined up behind the bench for a game. When your player takes off their warmup and stuffs it into a bag it’s more likely they’ll get the right soccer bag if their name is embroidered on the front. A good bag will have a separate compartment for the ball and for the gear, a place to put a water bottle (preferably two), and at least one zipper pocket that can hold things like snacks, hair ties, sunscreen, or player cards. Our son’s team ordered the Diadora Squadra Backpack in his first year of competitive soccer and we were hesitant at the time to spend the money but in hindsight it was well worth it. The soccer bag lasted him several years and we’ve started our other kids out with the same bag. In the photo above you can see several kid still using it 4 or 5 years later. This is a nice series because it’s affordable, you can choose from many different colors (based on the color of their team) and has an open spot right on the front where you can add their name. These aren’t really necessary when your soccer player is younger and only has 1 game a day but if they’re playing multiple games in a day or getting dragged from their game to a sibling’s game it’s nice to have a pair of soccer slides. After their game they can throw their cleats in their bag and wear the slides which are more comfortable and save them from slipping on hard surfaces as you’re out and about between games. These also come in handy if they do any kind of soccer camps over the summer where they have multiple training sessions in a day and down time in between. One word of caution is you don’t want your kid wearing their slides on the car ride to the game and then realizing once you arrive that they left their cleats back at home. The nice thing about putting on their cleats at home before the game is you know they won’t forget them! You can usually get decent prices on Nike or Adidas slides on Amazon but keep your eye on soccer slide sales on some of the sites like soccer.com for good deals. If you’re already ordering something from the site you can sometimes add them onto your order for pretty cheap and it won’t cost you much extra to ship them. Occasionally they’ll have deals where you get free shipping if you spend more than some minimum amount so adding soccer sandals onto an existing order can be a good way to qualify for free shipping. Our son likes these Nike slides and our daughter has a pair of these Adidas sandals. Coaches hate it when kids come to practice with a flat ball so try and pump it up before they get to training. If you already have a bike pump a lot of the floor pumps are built so you can snap in a needle and use it as a ball pump as well. We like having a portable ball pump that we keep in their soccer bag. That way pumping up their ball is their responsibility and not ours. If it ever gets low they can air it up quickly before practice. We use this Nike hand pump, it doesn’t have a pressure gauge built in but it’s small and inexpensive. You might order a few extra needles to keep around for when they get broken or lost. It seems it’s always when you need a needle most that you can’t find one. At the last United Soccer coaches convention the Torrx ball pump had a booth where we could check out the electric ball pump. It was neat how you could inflate and deflate the ball with the push of a button and that it had a built in gauge but for just one kid it seemed really pricey. If you’re a coach I could see it coming in handy if you were constantly having to fill up soccer balls at the start of practice but for just one kid it seems your soccer budget could be better spent elsewhere. If your kid only has one soccer ball don’t bother with this but as you accumulate soccer balls over the years its nice to have a way to keep them organized in the garage or in your car. We didn’t get one until our 2nd kid started playing soccer. We bought a bag for two reasons. First off our son had accumulated enough soccer balls over the years that they were starting to roll all around the garage – then once my daughter started playing she wanted pink balls instead of using his old ones so the sprawl of Nike, Adidas, and Umbro ball kept increasing. Secondly he started wanting to do more shooting practice so we’d buy several more balls when we’d see them on sale. If you’re going out to the field or park to work on shooting it’s nice to have 5 or 10 balls so they can get into a rhythm when working on their technique. It’s a lot easier to drag all those balls out to the field in a mesh ball bag than to try and carry them. Get one with a drawstring so you can cinch it up tight so the balls don’t roll out while you’re transporting or storing them. Soccer cones are good for working outside of practice in the yard or in the basement. You can use them for setting up goals or creating a playing space for your kid to dribble around in. Soccer is a lot about controlling the ball, with cones you can create a defined area they can try to stay within as they play. You can also create challenges for them like having to dribble through a row of cones. For younger kids you can set it up as a game so it doesn’t feel like “practice”. If your player is interested in improving as they get older there are many home soccer training programs like Renegade Soccer Training, Beast Mode Soccer, Techne Futbol, and Rise Futbol that give them lots of choices for working on ball control at home. They all use a cone setups in their various drills so if you buy a set of soccer cones when they’re young you’ll probably use them for years to come if they keep playing. Cones aren’t very expensive, for example you can get this set of 20 cones for $12. One downside to that set is all the cones are the same color. When you’re setting up games in the yard it is nice to have multiple colors of cones so each can have a different meaning. For example, our kids play a version of “musical chairs” where there are cones setup around the yard that they dribble through as the music plays. There’s a rule that they must dribble through cones of a different color. This way you can set them up so they’re having to change direction and move around, rather than just always staying in the same spot. That’s just one example but having multiple colors of cones allows you to be a lot more creative with the games you setup. So you can go with a set that gives you 2 colors of cones for around $15 or opt for an even bigger variety of red, yellow, orange, blue, and white cones for just a few dollars more. All the soccer cones we pointed out so far are your typical disc cones but there are a few others you might run across. One common type is a smaller disc cone, also called “mini cones”. Those work just as well and often give you more for your money. Some coaches use them in conjunction with the regular size disc cones and the smaller ones have a different meaning in the drill but for use at home you don’t really need two sizes of cones. They also make “jumbo cones” but those usually cost more per cone and if you don’t need them bigger then why spend the money. One type of cone that you might be interested in are “flat soccer cones” or field markers. These are nice because they lay flat to the ground so they’re less likely to get moved around by kids or balls running into them – especially if you’re using them on a hard surface like in a basement or garage. They also don’t crack and split if players accidentally step on them like disc cones do. The downside to the flat markers is if you’re practicing in long grass they’re harder to see than disc cones. We’ve always gone with the green Gatorade squeeze water bottles. Holding 32 oz of water they’re usually good enough for a single game. On a really hot day it’s good to have two full bottles. We get the six pack of water bottles because it saves money and we know we’ll use them all between our 3 kids. You probably want to just go with the two pack if you only have one kid playing soccer. One thing that’s been frustrating with the Gatorade bottle is that they recently changed the design of the bottle lids and the new lids don’t fit right with the old bottles. So now we have a mix of old and new bottles and lids in our drawer and they’re not all compatible with each other. Hopefully that won’t be a regular thing, seems like it’s only happened once in the time we’ve been using the bottles. Since so many players have similar looking water bottles we do something to make ours stand out – in addition to writing their name and phone number on the bottle with permanent marker. Usually we wrap a piece of orange duct tape around the middle of the bottle. This helps it stick out but there are other parents doing the same thing so we also started putting some small object underneath the duct tape. For example the plastic cap to a disposable water bottle. Something small that the tape will hold but is obvious when they pick it up, you can see an example in the photo. It’s actually pretty funny that all the girls on my daughter’s team really wanted to know what was under the tape on her water bottle. Shows that it works, when they grabbed that bottle by accident they always knew whose it was. If you have a daughter who plays soccer it’s worth getting a pack of 20 or 30 elastic hair ties and putting them in her soccer bag or your car. I can’t count the number of times I’ve watched my daughter run out of the car and onto the field with her hair flying behind her as I realize that we forgot to put her hair back for training or a game. You can order them as an “Add On” item on Amazon, where they’re so cheap that you have to order them along with other items in order to buy them. Something else you can keep in their bag is a roll of pre-wrap so they can make their own headband if they forget to bring one. Here’s a video where Alex Morgan shows how she uses pre-wrap to make her famous pink headband. Whether you play in the Fall or the Spring chances are you’ll run into cold weather at the end or start of your season and could have some really cold games. You definitely want your kid to be prepared for this cold so it doesn’t turn into a miserable experience. We’ve had several games where afterwards the coach had to send out an email asking parents to please dress their players warmly for those types of games because kids were so cold and miserable they refused to go onto the field. It’s hard to blame them when they’re only wearing shorts and a jersey and it’s 35 degrees and a freezing drizzle is falling. They’d much rather stay under the blankets on the sideline. Kids that are prepared for the cold are more comfortable, play better, and actually have fun rather counting down the minutes till the final whistle blows and they can feel their fingers and ears again. Many leagues don’t allow players to wear coats or sweatshirts over their soccer jersey so in the cold weather they’ll need to wear something warm underneath their shirt. It’s no fun when kids come to play with a sweatshirt on and the ref makes them put their shirt over it. Changing in the freezing cold is a drag and trying to pull a soccer jersey on over a bulky sweatshirt or jacket can be pretty uncomfortable. Some leagues don’t allow sweatshirts with hoods so that a player isn’t accidentally (or purposefully) grabbed by the hood and yanked backward, tweaking their neck. The best way to avoid these issues is to get your player a long sleeve undershirt or two that they can layer underneath their soccer jersey. One with a mock turtleneck can be nice as well for cold weather. One tip to help them stay warm. If you think it’s going to be cold have them put it on before the game rather than just in their bag. If it’s in the bag and they’re cold they might not be bothered to put it on. If they’re wearing it and they get hot enough then they’ll take it off. The Under Armour Cold Gear is nice because they have the options of the mock, crew, or fitted mock. Each kid is different in how they like the fit and they’ll likely wear it a lot in early spring or late fall so go with the one that’s most comfortable. The Cold Gear undershirt is also nice because it comes in a variety of colors (red, white, grey, black) depending on the jersey color. My kids prefer the fitted black mock for under their jersey, goes with any color. The black is nice because you can pass it down from kid to kid as the older ones grow into larger sizes. If you live anywhere in the MidWest the undershirt is a must for Spring and Fall soccer, might not be as important for lucky folks in warm soccer states like California, Florida, or Texas. Even though shinguards and socks cover up part of their legs having bare skin around the knees exposed when temperatures are low and it’s raining or snowing can be unpleasant. All our kids wear leggings underneath their shorts in the early Spring and late Fall. The Under Armour ColdGear Leggings have worked well for us. They put them on first before shin guards, socks, or shorts and they really help them stay warmer. These are comfortable enough that our kids will keep them on after a weekend morning game as they go about their Saturday. You might need two pairs of these during a season if your player goes to the ground a lot and rips up the knees. Going with a black color is good for passing them down from kid to kid but they probably won’t last as long as soccer under shirts do. When kids are running around a freezing cold soccer field their fingers are some of the first things to go numb and make them want to come off the field. Having a pair of field soccer gloves can mean the difference between a miserable game and a fun game in early March or late November. Referees don’t have issues with kids playing with gloves on but if your player is at an age where they’re at 7v7 or a bigger formation they’ll be taking throw-ins when the ball goes out of bounds. In this case having gloves with grip make it easier to throw the ball in with gloves on. Trying a throw-in with regular gloves can lead to crazy throw-ins with the ball slipping out of their hands before they’re ready. We ended up going with these Adidas soccer gloves, just keep a pair in their soccer bag during the early Spring or late Fall. We’ve learned that the stocking caps with strings tying underneath seem like a good idea for young kids running around on the soccer field but a lot of times they don’t like having something under their neck. So if they’re designed to be kept on with a string but not tied as kids run up and down the field then eventually they might slip off. Especially the hats with crazy/cool looking tops that look neat but end up being top heavy and sliding right off. A basic stocking cap is usually best for cold weather soccer. If your daughter has a pony-tail to tuck into a stocking cap that can be uncomfortable so she might want an ear band that doesn’t mess with the ponytail but still keeps her ears warm. These pop up sports pods take sports umbrellas to the next level. If you’ve ever been to a soccer tournament in February you’ve probably seen them along the sidelines. This is a picture from a beginning of the season tournament where every parent that didn’t have one probably wished they did. We actually try and avoid playing in games that early in the Spring but this tournament needed a team to round out their brackets so we couldn’t say no to a free entry. We don’t have an Under the Weather pod but I’ve never been as cold as I was for the night games of that tournament and would’ve gladly given a parent $20 to let me sit in their sports pod that night. Usually if I dress appropriately I’m not miserable at cold games which is why we don’t own an Under the Weather. I don’t really mind being cold but if you’re a soccer parent who detests the early spring then a pop up sports pod could make games more bearable. At some fields you get lucky and can sit in the car to watch when the weather is terrible but with some games if you want to see the action you have to be on the sideline. We’ve never tried one of these out ourselves but I’ve seen enough in use during the early Spring and late Fall to know that some soccer parents are big fans. Often on the coldest mornings and evenings I see younger siblings hanging out on a blanket at the bottom of the “Under the Weather” tent and parents standing next to it shivering away! Each standard sports pod only fits one person so you and your spouse will have to fight over it unless you get two but they’re certainly not cheap. They’ve started coming out with these pop up pods that are big enough for 2 or 3 people but those are more expensive. Here’s where you can get a base model for the lowest price of a cold weather sports pod. We talk about soccer blankets a little farther down because they’re useful for multiple reasons, not just cold weather. However, when it’s really cold some of the smart soccer moms on our team bring along sleeping bags in their trunk. They’re always the warmest spectators out there. They step into the sleeping bag and pull it all the way up to their armpits and settle back into their folding chairs to watch. We were wrapped in soccer blankets last weekend for a cold early morning game but the wind always seemed to find it’s way in somehow. It wasn’t so bad at the start of the game but by the end we were pretty frozen. The lady next to us sitting in her sleeping bag was warm and toasty. She had another game right afterwards for her other daughter so the sleeping bag was a good move. It took us the whole drive home, plus some to thaw out – we should’ve had sleeping bags! We already covered equipment for cold weather but when soccer stretches into May or June you’ll want to be prepared for hot weather as well. The soccer umbrella we suggested for shielding you from rain/snow also doubles nicely as a sunshade. Here are a few other suggestions for handling the heat on the soccer field. Some of our local soccer complexes have installed sunscreen dispensers but probably most youth soccer fields don’t have sunscreen included. The last thing you think about when you’re rushing off to a game is sunscreen but if you don’t have it when you need it then you and your player could regret it the next day. At the start of the season just order a few bottles. We’ve started getting 3 different kinds of bottles. One small bottle for each kid to keep in their soccer bag and two big bottles to keep in the car. We buy one bottle of sunscreen lotion and also a spray bottle for putting it on your kid when you’re in a hurry. As the kids get older what we’ve started doing is passing the big bottle of sunscreen around the backseat on the drive to the games and having the kids put it on themselves. Then once you arrive give them a once-over and see what spots they missed. Much faster than waiting until you arrive at the field. If you don’t get a chance for them to lather up on the way then the aerosol bottle is a nice fast way to spray them once you get to the field. You don’t really want your players spraying it in the car so it’s nice to have the lotion as well for car rides. During the hot months of the season we keep two cooling towels in our freezer. We put them in dry, if they’re wet they take a lot longer to thaw out. Before a game we fill a quart Ziploc bag part way with water and throw the two towels in there as well. At game time they’re nice and chilled for cooling off when players sub out on the bench. These aren’t necessary, just nice to haves but can really help if your kid tends to wither somewhat in extreme heat. When you play on these turf fields on really hot days the temperature gets high enough to the point that they enforce mandatory water breaks during the game. Those are the perfect days to have a chilled cooling towel in the bag to put on the neck or over the head. You can get some pretty cheap ones on Amazon so it’s not a bad idea to pickup 2 or 3, especially if you have a few kids. A sports tent isn’t something that every soccer parent needs to buy but it’s really nice if at least one family on the team has one. Putting up the sports canopy over the bench gives a nice break from the heat when players are subbed out or during half time. If they’re lucky the coach might be able to find some shade to rest in during half time but many of these big complexes we play don’t offer much or any natural shade. A 10×10 shade tent should work or you could go with a 12×12 tent to give a little more coverage. Some coaches might have their own tent or sports canopy but it can be tough for them to bring it to the game. Particularly if they coach multiple teams it’s tough to lug around a canopy as they rush from game to game. This makes it really nice if a parent can bring a canopy, set it up, and tear it down afterwards. They’re not cheap but if you can find one on sale it can be worth the money over a few seasons of use. I often see Dicks sporting goods tents on sale over the summer. Usually the canopy sales are around Memorial Day, Labor Day, and July 4th weekend and sometimes are up to 50% off the retail price so keep an eye out for the canopy sales. So far most of the items we’ve gone over are for your players but what about soccer parents? Just like there are a few things you want to make sure your kid remembers for every game there’s also a checklist of items that you’re probably going to want on the sidelines – like a wagon, umbrella, chairs, and blankets. If you’re going to sit through hours of freezing cold or blazing hot games this season you can at least make it a little more convenient or comfortable for you. If you only have one kid then hauling a wagon around isn’t worth the hassle but if you have multiple kids the wagon is worth the money. Instead of dragging chairs and blankets and things to entertain siblings to soccer games it’s really nice to be able to pull them all in a wagon. These wagons fold up nicely in the trunk of your car and once you’re at the field you can throw all the chairs, blankets, etc in the wagon along with your other kids. As a soccer parent of 3, the folding sports wagon has been one of the most useful purchases we made specifically for ourselves. It doesn’t help out our players but certainly makes life easier for a soccer dad or soccer mom. When it comes to collapsible wagons it’s well worth spending the money to get a quality wagon. Our first one was the cheapest one we could find and it didn’t even last a whole season. Remember you’re going to be pulling this through fields and over curbs and it will have little kids jumping into and out of it. You want wheels that won’t break off and a metal frame that won’t easily bend out of shape. We’ve had ours for several years now and would recommend it to any soccer parent with young kids. After last season ours was struggling a little and we looked at buying a new wagon but they’re not cheap so a little maintenance (replacing a few missing screws) got it back into season ready shape. The best folding sports wagon we’ve found is the Mac Collapsible Folding Utility wagon but you can get them from a variety of places like Costco, Walmart, and Dicks Sporting Goods. Dicks often has a big sale on folding wagon sales at the start of each soccer season. One of the things we skimped on for years was a good sports umbrella. I think it was mostly because we had a closet full of small, cheap umbrellas that we’d throw in the trunk every Spring. One less thing to spend money on. It feels like sports parents are having to write a check every other week for some fee or other so we’re not really looking for extra things to buy. In our case my wife bought me a Maxfli Golf Umbrella for my birthday one Fall and I’ll never go back to using one of those puny regular rain umbrellas. With as many raining, sleeting, snowing games as we attend as soccer parents a giant sports umbrella is well worth the money. I actually went out and bought a umbrella so we could have one in each of our cars. The nice thing about this big golf umbrella is that you can sit in your sideline chair and as long as the wind isn’t blowing the rain horizontally the Maxfli umbrella keeps you pretty dry during the game. Another great use for it that I didn’t think of at first is blocking the sun once the spring season stretches into tournaments and State Cup in May and June. Our youngest can put down a blanket and pop up the big umbrella and stay out of the sun during their siblings games. In the winter she uses it as a windblock. One tip is try and be courteous with whatever umbrella you use. Ours is a good size but we’ve been much bigger ones out on the sidelines. They block a lot of rain and sun for soccer parents but they’re also unfortunately good at blocking the view of other spectators so try and be aware of where you’re popping up your soccer umbrella and who you might be blocking when you do. We’re not the best family to ask about folding sports chairs because we take a different approach to buying folding chairs. As we race from soccer game to game between our 3 kids it’s not uncommon for us to leave a folding chair behind. We lose enough chairs that I usually go the lower price route when it comes to buying sideline chairs. On top of that I never spend a whole game sitting down – between taking photos, helping our other kids, and running back to the car it’s unlikely that I spend much of a game in a chair anyhow. It’s probably worth spending the money for a nicer chair for the comfort for some soccer parents but that hasn’t been the case for us. At the start of each soccer season we usually buy a few new cheap chairs and by the end of the season we’re often down to just one chair left. Here are the chairs we buy from Dicks Sporting Goods. We usually wait till they have a sale and then buy several at once. You can certainly spend a lot of money on a folding chair, like all the other things we’ve listed the best approach is to shop early to get discounts or buy in end of season close outs. Your family will likely spend so many hours at cold soccer games that having a blanket or two (or 3 or 4) in the car will help make it a more enjoyable experience. Our approach has been to have a few different soccer blankets. Our best soccer blanket is a big one, 54 x 84, that an adult or player can wrap up in all the way. It’s also big enough it can stretch across two sideline chairs right next to each other. This is the most expensive blanket of the bunch, reserved for parent use on the sideline because we don’t want it getting lost on the player bench. Since we’re MLS fans ours reps our local team but what’s really important is that it’s BIG. This soccer blanket is nice because you can get a version for whichever MLS team you support. The other blankets we use are smaller cheaper blankets that are more kid-sized. We send one to the bench for players to use in cold weather to keep warm while they’re subbed out. The other blankets we use for siblings to wrap up in or in nice weather for them to spread out on over the grass or turf. Definitely write your name and phone number in permanent marker on all the blankets because chances are that at least one will get left at the field at some point (this is why we keep the bigger/nicer blanket on the sideline for the soccer parents). Soccer blankets can come in handy in the hot weather as well for siblings. Our kids stretch them between chairs or throw it over the folding wagon to block the sun while at their brothers or sisters soccer games. Another blanket tip if you don’t want to spend the money on a big soccer blanket is to buy fleece fabric somewhere like Joanns and make a no sew fleece tie blanket. The one we have had fabric that was 58 inches wide so just buy enough fabric to make it as long as you need to wrap up in on the sidelines. Items like team shirt, shorts, and socks you’ll need to wait to hear from your coach about what to buy. Often your club or soccer organization will have a process for ordering uniforms or they might provide players a shirt and have families get their own shorts and socks. Our team has had good luck getting soccer socks for our rec teams from Epic Sports. They offer discounts for team orders so the prices are pretty affordable and they have a good selection of fun soccer socks for kids. They don’t offer free shipping but if you’re ordering a team set of socks you can split the shipping fees among the players so it’s pretty small. Just be sure to order early so you can choose the cheapest shipping option. We got all the soccer socks online shown in this photo, 4 seasons worth. One way to cut down on costs is to keep the same socks from season to season and just order a few pairs for any new players. If you haven’t heard from your rec coach about what you need and the season is getting closer don’t hesitate to shoot them an email to ask about what you need to buy. Many coaches at younger ages are volunteer coaches so they’re squeezing it in between work and parenting so they might forget to let you. If your kid is playing competitive soccer then you’ll likely have a team manager that coordinates team uniform orders. Be sure to stay on top of their emails because if you don’t order in time then your player might not have a uniform back for the start of the season. Unfortunately you don’t have a lot of control over the costs of uniforms when you’re part of a competitive soccer club but there are few ways that you can save money on soccer warmups and other team gear. If the trunk of your car is starting to look like this you might wonder what else you can fit in there but here are a few other things you might want to consider once the soccer season starts. These are perfect for holding muddy cleats and other gear after a rainy game so you don’t get mud all over the inside of your car. Depending on where you play it might not just be the players cleats that are full of mud. The trek to the fields from your car can have your shoes caked with gunk as well. If you have younger siblings along it can be hard for them to resist mud puddles for a whole game so keep an extra bag or two in the trunk for them as well. If you play on turf you won’t have to worry about the mud but wet shoes still attract little black rubber dots like bees to honey. You’ll spend forever brushing the black dots out of your car and out of your house so a bag for the wet gear can help to contain them a bit. Sometimes players are so soaked that it’s nice to have towels to put down over your seat. Or if it’s a really cold and rainy game they might want to crawl out of those wet clothes to keep their teeth from chattering and wrap up in a few blankets. We had a 7 AM spring tournament game in a downpour that was called halfway through for lightning. Everyone tried to leave the complex at the same time, which meant that basically no one could leave quickly because of the gridlock as the fields emptied. My soaking wet son was freezing cold but luckily we had some extra towels in the back he could wrap up in. Of course soccer blankets would work even better for this but ours were soaking as well since we had them out on the sideline. Having a band aid ready to cover a blister when you get to a game can mean the difference between your 7 year old smiling out on the field or crying on the sideline. If you have more than one player and you’re driving from game to game on a Saturday it’s nice to have some snacks to keep players and their siblings happy until you get a chance to find them some food. We keep it simple with granola bars or trail mix. There’s a fast food place next to one of the fields where our kids play and on soccer Saturdays it feels like some of the slowest service in the world. We made the mistake of stopping there a few times en route from one complex to the next. On one occasion it was taking so long to bring the food to the car we ended up waiting forever and then leaving without our order. Rather than put your schedule in the hands of a busy weekend restaurant just bring snacks. One tip if you do drop into a place to eat between games is to download their app ahead of time. This way you can figure out what everyone in your family wants on the sideline of the first game. You can order ahead so you’re able to pull up, grab the food, and race off to the next game. Of course as a new soccer parent you shouldn’t rush out and buy all these things at once because that would get pretty expensive. This does seem like a ton of stuff to buy all at once. I’m assuming you’ll probably decide to get nothing at first but once you’re “in the trenches” you’ll realize which of the suggestions might help your family out. As I mentioned at the start, for my son’s first competitive game he had no hat, no gloves, no coat, and no water bottle. Luckily there were more prepared parents at the game so he survived but I didn’t win dad of the year award. Since then, we’ve gotten better at being prepared. We still don’t always get it right but we’re at least better prepared. We’ve accumulated many of these things over the year as we’ve needed them. Now that you know what things could come in handy you can keep an eye out for when they go on sale. One of the secrets to finding good deals on soccer gear is to shop in the off season or to look for pre-season or season close out sales. Black Friday has always been a great time for us to get the best prices on soccer balls and other equipment. If you’d like a checklist of the gear we’ve found useful organized by season and age along with the specific items that we recommend you can enter your email address below and we’ll send you a parent’s cheat sheet to kids soccer gear.